We’ve just released some great improvements to bubble sheet creation and printing! The first thing you’ll notice is that bubble sheets now pre-load and are generated faster. You’ll also notice that bubble sheets look a little bit different when you print them. Don’t worry! they scan exactly the same, and your older bubble sheets you’ve already printed will continue to scan. Updating bubble sheet printing is a first step towards additional improvements we’ll be releasing in the near future. In addition, you can now download your bubble sheets as a pdf and save them for later. Check out the video below for a quick look at the new update, and keep on trackin’! We are happy to announce the launch of the MasteryAssess app for Windows devices. MasteryAssess is the new name for our popular BubbleSheet app, previously only available on iOS and Android. 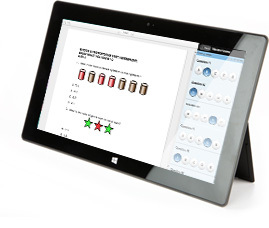 MasteryAssess allows students to take assessments directly on their tablets, smartphones and other mobile devices. With a MasteryConnect account, teachers can create and upload assignments or assessments in any format (Word, PDF, Google Drive, etc) and then deliver them automatically to their students’ devices through the MasteryAssess app. After completion of an assessment, scores are instantly synced with a teacher’s mastery tracker, enabling real time interventions with students. Students receive immediate feedback about their learning relative to both state and Common Core standards. What’s more, MasteryAssess is more than just multiple choice items, and can be used in a variety of ways. The app also supports Technology Enhanced Items (TEIs) such as those that will soon appear on PARCC and SBAC assessments. Click here to get the MasteryAssess app for Windows devices. Download BubbleSheet (soon to be named MasteryAssess as well) on your Apple or Android device.